I had always thought about doing it. 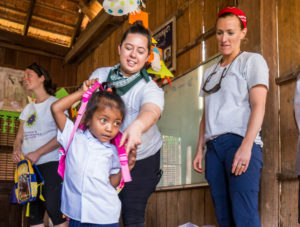 Some of my friends had done it, I had seen posts about it on Facebook, and I even donated money towards it, but I had no idea what to expect when I decided to make the commitment to do volunteer work abroad. I mean, I didn’t actually know what that looked like. The only volunteer work I had done was sorting out canned goods for the less fortunate during the holidays, though let’s be honest, my driving motivation was following a boy who was forced by his family to participate – but that was it. It didn’t take me long after making it “Facebook Official” until the doubts started to sink in. What if I can’t raise enough money? Am I too out of shape? Will I hold the group back? As comments like “you’re such a good person” and “thank you for doing this” poured into my newsfeed, my hesitations rose. Was I doing it for the right reasons? I talked it over with friends of mine, each more supportive than the last. “The truth is,” one of them lovingly explained, “it’s not about you. You’re doing a good thing, yes, and it’s easy to accidentally spin it back to be about you, but it just isn’t. There are women and children out there who deserve better, and you’re just part of the cause to support that.” She was right. My shortcomings shouldn’t have disqualified me from contributing; I wanted to help, so it shouldn’t have mattered what that looked like as long as I tried hard enough. The hardest part about volunteer work wasn’t the actual work (and there was plenty of it). The hardest part was fundraising, which is funny when you receive countless comments like “you’re such a good person” and “thank you for doing this.” The hardness of it carried less bite however, because I was soliciting for a totally legitimate contribution that went directly to funding resources needed for the project. But I get it. Asking people to give away some of their hard-earned money for a cause that will go to complete strangers is no easy task, especially when money is tight and times are tough. I’ve been there, and honestly, I think the biggest reason I donated before was because it went to an organization that my friend was running. Otherwise, I’d stare at a flyer or a post that was fundraising for a legitimate cause with my mouse hovering over the “Click Here to Donate” button and think to myself – I want to do this. I should do this. But ultimately I didn’t. So, I get it. I struggled at first because I didn’t want to pressure anyone into doing it, so once I reached out to my friends and family, I was at a loss for traction and – even worse – determination. I felt defeated. I talked it over with my friends for some words of encouragement. I explained how I worried about making someone feel like I was putting them into a moral dilemma if they didn’t donate. My friend came through for me again. “If they say no, then they say no and that’s okay,” she went on, “but if they make it personal, then that’s just that: a personal problem. That’s got nothing to do with you trying to help the world.” I thought back to a time when I was a teenager at an orientation for a door-to-door sales job. “For every 100 no’s, there will be a yes” they enthusiastically told us. “The point is that there will be a yes, but only if you try hard enough.” They were right – and that was just about luxury vacuums, not programs for women and children in a lower-income country. I was determined again. Once our six-person team fundraising goal was met, the real fun began. We asked around for second-hand items like crayons and coloring books for the kids, and suitcases to haul it over to Asia. Once the supplies were loaded and ready to go, I ran through my own packing list a third time before I zipped up my duffel bag: long sleeves, cargo pants, travel-sized hygiene items, and an extra pair of shoes. 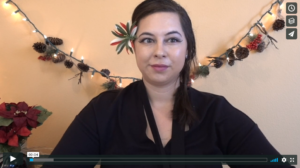 I kissed my husband goodbye and got on a plane for Southeast Asia. We first arrived in Bangkok, Thailand where we spent a couple of days sight-seeing before settling into Siem Reap. The humidity was real and the coconuts were fresh; we rested, walked around, and scarfed down delicious Thai street-food. With our bellies full and our sweaty skin moisturized, we were excited to get to work. Landing in Siem Reap was so exciting! Plumeria trees complimented the Khmer airport artwork, the sun beat hotter than in Bangkok, though I quite enjoyed the heat. 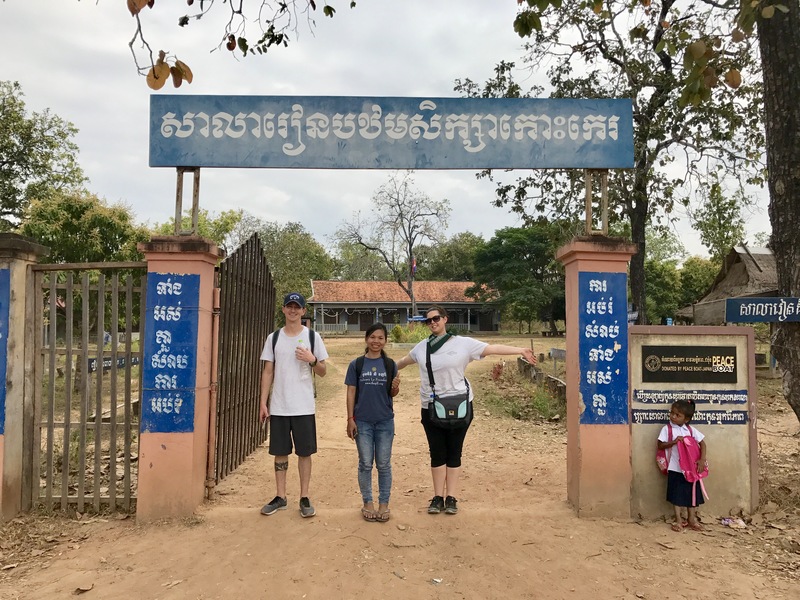 At curbside, we were cheerfully greeted by a local tuk-tuk driver, climbed inside with our luggage, and drove to our hotel to quickly unload, and then made our way to the Women’s Resource Center for orientation. We met with the wonderful women behind the resource center who explained what they do, and what they wanted to do. The WRC had already been in action for some time, providing free educational courses to women on topics varying from basic reading skills to sexual education to balancing a finance book. 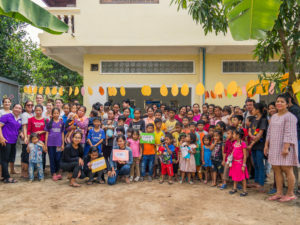 They explained that their next goal was to fix up the center, clean out the ground floor and outdoor area to hold more classes, and provide a play area for children. We scoped out the bottom floor and outdoor area next: tons of dirt, debris, and junk needed to be cleaned out before any landscaping could be done or any rooms could be washed and painted. We yanked up our pants, did a little stretch, and got to work. With only a few hours or so under our belts, we knew that we had our work cut out for us. Piles of debris were five-feet high, with potentially sharp or poisonous creatures inside them. 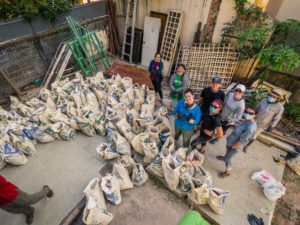 We sorted through the mounds with gloves on, chucking items like bricks, dirt, or trash into separate rice and cement bags. Once a bag was full, we’d find a friend to help us haul the bag to a designated area where they’d be picked up by a truck. If you were feeling particularly strong, you’d lug the bag over yourself. It was like the most practical, most affordable Crossfit program I had ever been to. Aside from sorting through the piles, we’d repeatedly rake, hoe, pick, pull, poke, and prod. We worked our tails off under an unforgiving sun, each night washing away coats of dirt and sweat, peacefully drifting off into sleep so that we could rest and do it all over again the next day. This would go on for at least a few more days. On a side note, I will admit that the work was as physically demanding as I had anticipated. I have chronic plantar fasciitis in both feet, so it didn’t pair well with standing, bending, walking, and putting weight on them each day, though this was a factor I considered heavily before I committed to the project. Although I couldn’t have cured my plantar fasciitis, if I could go back and prepare differently before the trip, I would have. I would have been more active in the gym and outdoors to get in “better shape” for the work. Of course, to be in better shape is a goal for the majority of us all; however, since the trip it has become a goal for me not only aesthetically and for my health, but also because I want to be able to do more work like this, more efficiently (I wonder if there’ll be any New Year’s gym promotions with “Volunteer work” as an option for a goal you want to meet). Once the most strenuous part of the project was completed, we felt exhausted but crazy-excited! We looked back at the yard, once covered with junk, that was now cleared and level. A cement walkway had been installed, and though the work wasn’t yet over, we were over the moon with what we had already accomplished. We then took the weekend off from working to sight-see. Samuth and Saven, our tour guides, would once again cheerfully greet us at the hotel in their tuk tuks, each with a container of face towels soaked in cold water and eucalyptus – to this day, the most exhilarating treat I have ever experienced on a hot day. 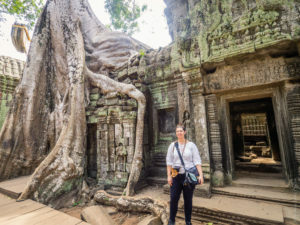 They drove us around villages, markets, and of course, ancient temples, including the famous Angkor Wat – a complex I had wanted to see up-close since I was a kid. I was so overwhelmed by the experience of it all, I teared up. I did that a lot on this trip, actually. After more eating, more shopping, and even a trip to the Cambodian Circus, we were ready to dive back into work. This time, we took a field trip out to Koh Ker to visit the Ponheary Ly foundation. There, we were delighted to see the bright faces of the children who go to school there. We prepared and cooked lunch with them, and the kids definitely showed us up with their carrot slicing skills. We went to each classroom to serve the students noodles and vegetables, and I refrained from sneaking some for myself (it smelled so good, y’all). After lunch, we handed each student a brand new backpack (which the fundraising helped to supply). I watched as each child walked up to the front of the classroom, grabbed a backpack with a smile, and then re-grouped with their friends to boast over their brand new accessory – and I did it all with a straight face. That’s a total lie, I bawled my eyes out – we all did. I have never known such a steady emotion of humility in my entire life as I discovered that day. The kids insisted they keep their backpacks inside of the packaging so they could go home and excitedly show their parents they had something brand new (now you’re crying, too, you’re welcome). After a weekend of more life-changing experiences, we went back to the Women’s Resource Center to clean-up the area we had been working on for their upcoming soft opening, a celebration with the community to introduce the center and invite women, men, and children to take part in a day of classes and fun. Once the raw landscaping was done, we washed and painted the ground floor classrooms over the course of a few days. We brought along a Bluetooth speaker to of course play Beyonce as we bent and stretched to get all corners and hard-to-reach areas. It was really coming together. At last it came down to decorating! We pulled out all of those crayons and coloring books and other donated supplies to spruce up each classroom. We had Khmer educational poster boards teaching fruits, vegetables, letters, and math. We set up different craft stations so that the kids had more than enough options for their play-day – even a slide was brought into the yard! Banners, artwork, and shiny paper borders adorned each classroom – it was a fulfilling sight to see. Once the day of the party came, we couldn’t wait to see it all come together. Although the center wasn’t yet fully complete, it was enough to open it to the surrounding community. Loads of families drove in on tuk tuks and motorcycles to join in on the fun. The Women’s Resource Center gifted our WECO team with their beautiful purple WRC t-shirts as a thank you, though we were in constant appreciation for letting us work with them. 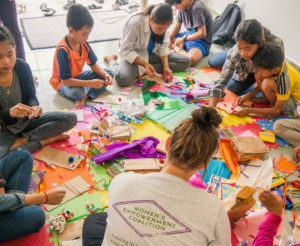 For an hour or so, we each took to a classroom where we watched and helped the children craft all sorts of things from paper plate masks to paper bag puppets. 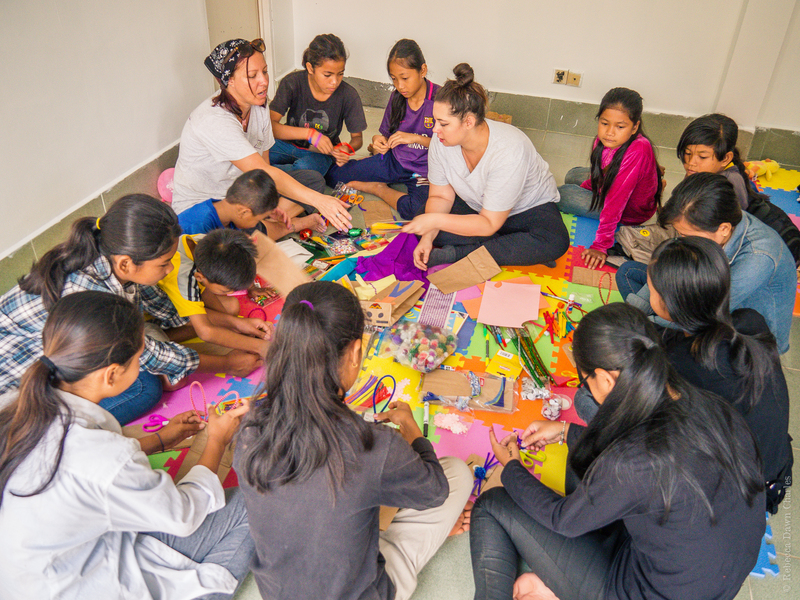 There was so much creativity flowing throughout the center in spite of most children never having done any crafting before. One girl even made me a snake crown, and yes, I cried about it. After crafting, we all sat down to eat (which is a nice way of saying that I stuffed my face full of everything as fast as I could because it was too delicious to have patience). The Women’s Resource Center gave a speech about their mission, inviting the community to partake, and they even hosted a quick class on the importance of health and hygiene. Men and women gathered around the instructor as she demonstrated; it was a great way to show the community one of the workshops they offer. Afterwards, I worked up the courage to give a special thank you to the community through dancing hula. 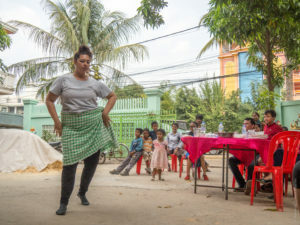 They then gifted us back a traditional Khmer dance lesson – this was one of the most precious moments for me, in all of my life. To be able to share cultural traditions with a community on the other side of the world was so special, so sacred. I will cherish it always. Once the party ended and we shared our goodbyes with the Women’s Resource Center, the WECO team sat with each other to let emotions wash over us. Sure we were exhausted, but we were floating on clouds. How incredible, this time we shared with one another. How special. What an experience. It was bittersweet to pack up and check out of the hotel (especially because of how much I loved the in-room massages). But off we went, to rest for a few days in Thailand before starting the trip back home, our lives changed for the better. The Women’s Resource Center has since completed the second phase of construction, adding in sliding doors and extra child-safe precautions. On the surface, it may not seem like much, but a place like the WRC is important not only for women and children but men, too. 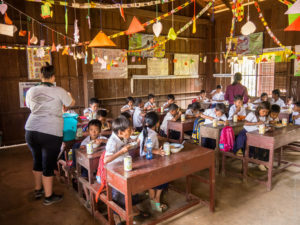 Through educational classes and group discussions, change can and is happening for all of the community – to instill equal opportunity and provide a safe, hopeful place for families to thrive. To be part of this change in even the smallest of ways is nothing short of deeply impactful. Since returning home, I have found myself more patient, more empathetic, and more aware of my privileges. I’ve carefully approached conversations before weighing in with frustrations instead of solutions, and I’ve challenged myself to be more actively aware – if not involved – in local and overseas matters, to take the time to care. I want to remind myself of this trip as often as possible so that I can be part of the ongoing mission to help in whatever way I can, and that’s what WECO is all about.